On a recent walk in the Lanark Highlands, I recorded pages of blooming "stuff" in my field notebook and pulled it out this morning for another look - not a shabby gathering for just a brief ramble in the woods, fields and fens of the Two Hundred Acre Wood and along the beaver pond. Such exercises are never simple laundry lists, but an expression of the abundance on offer here in summer, an appreciation too of what Mother Earth holds out to us in her own good time and seasons - they're also powerful reminders of what a special place this little blue planet is. Most of the species listed this morning provide shelter and sustenance for wild cousins, munching for the furry and nectar for the winged. Always of particular interest is milkweed which draws Monarch and Viceroy butterflies and serves as nurseries for their eggs and caterpillars. Stands of kindred Swamp Butterfly Weed near the pond sport bright pink buds, and they sport dragonflies and damsel flies as do the silvery spatterdock leaves a little further out. The tall water grasses along pond and stream were in ceaseless windy motion this week, a panoramic blur of dancing emerald green that made focusing a sometime thing. A family of wood ducks detached themselves from the reeds and flew away protesting to splash down in the center with much quacking, beyond the loving scrutiny of eyes and lens. A few swallowtails fluttered in the distance, and the air over the water was full of iridescent dragonflies. It's all good, even if the deer flies and mosquitoes were out and about in profusion. Ah abundance! And I am sorry you had to sacrifice a bit of blood to the cannibal insects! Love the milkweed! 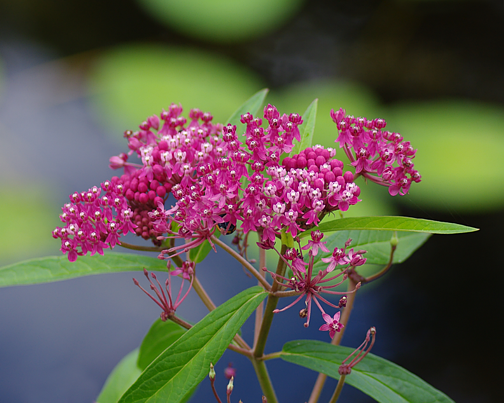 My swamp milkweed died a few years ago. I still have the orange milkweed blooming now.